Mystery Bags are NOW AVAILABLE in our Etsy store! The end of the year finds us swamped with extra sewing and craft supplies: fabric, trim, notions and craft materials that we've purchased for pattern development, tutorials, crafts  and even some of our own personal costumes and cosplay. We need to clear these out to make room for FUTURE goodies, so we're ruthlessly pulling yardage and items from our storerooms and workrooms and packing them up for YOU to enjoy. CLICK HERE TO GO DIRECTLY TO THE MYSTERY BAG SALE IN THE LEE & PEARL ETSY SHOP! What's in each bag? That's the MYSTERY. Each bag will be different, because everyone deserves a little BLIND BAG excitement! Here's a refined selection, perfect for school girl or boy dolls: a two-sided chocolate brown leather, a forest green washable cotton moleskin faux suede, an elegant twill shirting, a nubbly oatmeal jersey, an itty-bitty black-and-white check calico, a perfect doll-scale cable knit  all combined with a generous length of faux-suede lacing and a strand of semi-precious chip beads. Or perhaps you'll get this fantasy-inspired collection: a black-and-silver mesh studded with flat sequins, a scrumptious, washable pink cotton velvet, a renaissance-style paisley silky, an iridescent chiffon with a flame-colored sheen and a creamy white faux fur  all combined with color-coordinated sequins, seed beads and gold lacing. Do you like these selections? Now imagine EVEN MORE! We have so many pretty woven fabrics, fun knits, elegant velvets, supple suedes  both faux and REAL  fake fur and feathers, theatrical and millinery thermoplastics like WonderFlex® and Fosshape®, an entire store inventory of high-quality embroidery floss, sequins, beads and buttons, lacing and elastics and... well, you name it, we've got it  and someone is going to get it in a Mystery Bag! We're even cutting up the remains of the costly clear vinyl we got to make our Pattern 1025: She Blinded Me With Science safety goggles! Want even more mystery fun? Buy MORE THAN ONE BAG. We'll pack each bag as it's ordered, so we can make every effort to avoid duplicate contents in multiple-bag orders. 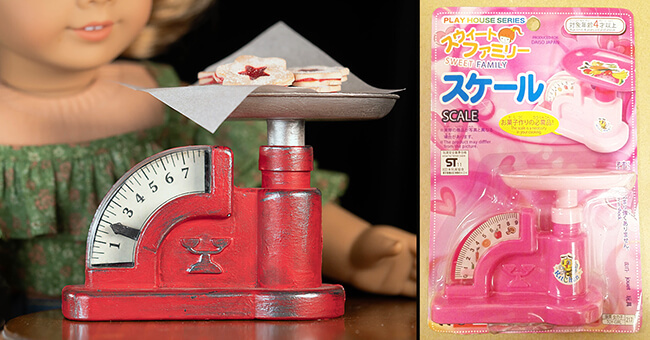 We'll also send multi-bag orders in a FREE priority mail BOX instead of a bag, and include a carefully chosen CRAFT SUPPLY or DOLL ACCESSORY from our stash in each box  like this pink plastic grocery scale, which we turned into the red-enamel-look antique version in a painting tutorial in our last newsletter. "Pearl" couldn't resist making one last item out of a glorious length of purple washable cotton velvet that we bought years ago for professional costume design. Doesn't it make a splendid Pattern 3001: A Late Medieval Lady's Wardrobe for 18 Inch Dolls? We're cutting extra-generous lengths of this fabric to go in Mystery Bags, so that  with some careful layout planning  you can make the same kirtles with the velvet nap facing in the right direction on every piece. This is truly a splendid fabric, and we have it in salmon pink and a gorgeous medium blue as well. These are bolts we've been hoarding for years, and we're finally ready to let them go. And here's some more news  look for the 16 Inch A Girl for All Time and 14 1/2 Inch Wellie Wisher re-sized versions of this gorgeous, historically-accurate pattern COMING SOON! CLICK HERE FOR THE MYSTERY BAG SALE IN THE LEE & PEARL ETSY SHOP! Copyright © 2018 Lee & Pearl. All rights reserved.